$4,580 Includes Round-Trip Kenya Airways Direct flights from JFK to Nairobi. 1 night Fairmont The Norfolk Hotel, 2 nights Fairmont Mount Kenya Safari Club, 3 nights Fairmont Mara Safari Club. If spotting the Big 5 has long been on your wish list this Fairmont Moment Safari will bring you one step closer. Combining one of a kind luxury Kenyan lodges with phenomenal wildlife experiences, this adventure encompasses the best of Kenya's culture and nature. Depart from New York (JFK) on your Kenya Airways direct flight to Nairobi. Upon arrival at Nairobi at Jomo Kenyatta International Airport, you'll clear passport control and customs before being met by your driver and transferred to Fairmont The Norfolk Hotel. Kenya’s vibrant capital is your safari starting point. A luxurious city retreat since opening in 1904, Fairmont The Norfolk is a sophisticated spot amid tranquil, tropical gardens. This elegant city oasis has long been a high-society rendezvous. Your evening is at leisure. Overnight at Fairmont The Norfolk Hotel on a bed and breakfast basis. 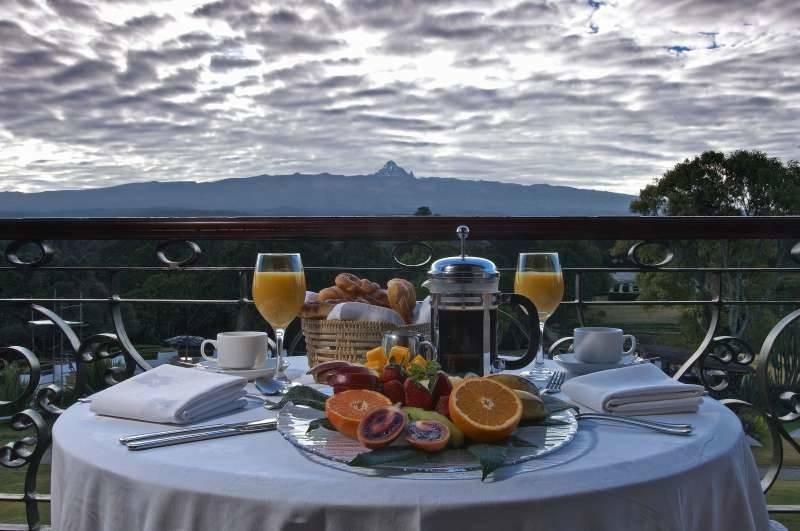 After breakfast the Guide/Driver will drive you North to the prestigious Fairmont Mount Kenya Safari Club, a celebrity haven since movie star William Holden founded his exclusive club here in 1959. Set among sprawling landscaped gardens, this secluded spot on the slopes of Africa’s second-highest mountain has played host to such luminaries as Sir Winston Churchill and Bing Crosby. Enjoy spectacular mountain views and experience the buzz of driving a ball across the equator on the hotel’s manicured nine-hole golf course. Overnight at Fairmont Mount Kenya Safari Club on a full board basis. A resident naturalist guides you on an exhilarating nature walk along the River Likki, where you can keep your eyes peeled for swooping hornbills or red-winged starlings. You’ll also visit Mount Kenya Wildlife Conservancy, which shelters the endangered mountain bongo and has been rescuing orphaned and injured wild animals since 1967. Following a lunch of locally farmed specialties at Tusks restaurant, which also offers fabulous views of Mount Kenya's dramatic peak, you can arrange optional activities such as game viewing on horseback. Or how about simply taking in the scenery with a chilled, handcrafted cocktail by the pool? After dark, savor fine cuisine and the atmospheric sounds of the wild with an unforgettable evening of riverside bush dining. Back at the hotel, share memories of the day over a nightcap beside a roaring fire. Overnight at Fairmont Mount Kenya Safari Club on a full board basis. After breakfast you will be transferred to the airstrip for schedule flight to the Mara. You may be lucky enough to spot the Big Five from above as you fly across the Great Rift Valley to the wildlife-rich Masai Mara Game Reserve. Your three night base at the Fairmont Mara Safari Club is no ordinary camp. Luxurious tents come with super-comfortable four-poster beds and private bathrooms, plus decks for spying wallowing hippos and crocodiles in the meandering Mara River.Upon arrival at the airstrip in Mara‚ you will be met by a driver/ guide who will transfer you to Hammerkop Migration Camp Lodge as you enjoy a short game drive just before check in. After lunch you will depart for a late afternoon game drive or enjoy other activities offered at the camp. Overnight at Fairmont Mara Safari Club on a full board basis. The Maasai Mara is arguably Kenya’s most popular game reserve. It is most famous and most visited game reserve in Kenya. The film “Out of Africa” was made to a great extend in this sanctuary. Thrilling morning and afternoon game drives led by expert naturalists will bring you up close to the reserve’s diverse inhabitants. As well as having another terrific chance to check off the Big Five (buffalo, leopard, elephant, lion and rhino), you might encounter sprinting cheetahs or herds of zebra on your way to a sundowner, otherwise known as happy hour. Look out too for side-striped jackals and graceful Thompson’s gazelles, along with hundreds of bird species. More than 1.5 million wildebeest migrate to the reserve between July and November, swarming in the thousands across the Mara River while crocodiles snap at their heels. Overnight at Fairmont Mara Safari Club on a full board basis. A highlight of your trip is apt to be the early-morning hot-air balloon safari. You'll glide above the Mara plains at sunrise on a unique game-viewing experience before gazing out at the Savannah and adding to your animal tally over an al fresco champagne breakfast. An optional tour to a local village introduces you to Masai culture. Chat about Masai traditions with the men, learn about the construction of mud huts and watch women craft colorful beaded jewelry. Overnight at Fairmont Mara Safari Club on a full board basis. Following an early morning game drive and breakfast, guests will be transferred to the nearest airstrip for a scheduled flight to Nairobi. Upon arrival, guests will be met and transferred to Fairmont The Norfolk Hotel. Afternoon at leisure. Later in the evening you will be transferred to the International airport for your flight home. NOTE: This tour can begin in SFO, LAX or SEA instead of JFK, however, this would necessitate earlier travel time at the beginning of the journey. Please contact us for prices for this option. • Round-Trip flight from JFK to Nairobi with Kenya Airways. • Flight from Mount Kenya to Masai Mara. • Flight from Masai Mara to Nairobi . • Return airstrip transfers at Nairobi, Mount Kenya & Mara. • Meet & Greet services if the pick up is at the Airport, or pick up within Nairobi and its environs. • Services of a professional English speaking driver guide. • First aid kit in the vehicle. • 24 hour backup service. • Drop off either at the Airport or within Nairobi and its environs. • All items of personal use i.e. drinks, laundry, telephone calls, gratuities, personal travel insurances- etc. Prices are in US Dollars and are per person based on double occupancy accommodations and include fuel surcharges, Government taxes, departure fees and September 11th Security Fee.